The Cactus Conservation Institute (CCI) is working to obtain a scientific understanding of the biological and ecological requirements of the cactus species peyote (Lophophora williamsii) and star cactus (Astrophytum asterias), as well as gaining the community support needed to acquire and maintain a large enough tract of land in the South Texas habitat in order to ensure that both of these plants have a permanent and protected sanctuary. You can read more details about supporting the CCI at their contributions page, and learn how they are going to spend your money at the scientific research program page. PayPal allows donations to be made in almost any currency and all contributions help - you can also support the CCI by spreading the word on internet forums and boards, blog posts or via mail. Donations are tax deductible for US citizens. The Cactus Conservation Institute's president and co-founder Dr. Martin Terry holds the required DEA and Texas Department of Public Safety registrations to conduct research on peyote - vouching for serious (and legal) research. 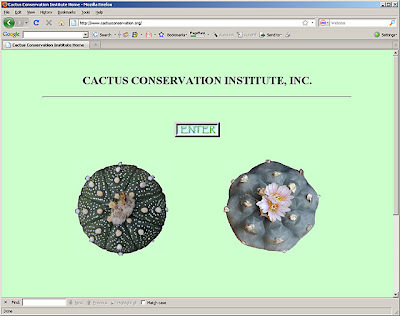 Martin Terry's PhD dissertation, A tale of two cacti: studies in Astrophytum asterias and Lophophora williamsii, is an interesting read and gives an understanding of the work done by the CCI. The CCI is dedicated to the study and preservation of vulnerable cacti in their natural range – starting with peyote and star cactus. To accomplish this vision the latest techniques are being applied to understand these vulnerable hunted species, from their DNA up. All interests are being respected: the regulatory agencies, the Native American Church, the ranchers, as well as the scientific community. I have to elaborate a bit on the "save the peyote" subject line. Peyote is not designated as endangered and not in need of being saved per se, but (to put it in the words of the CCI) "peyote is endangered at the local population level in those areas where peyoteros have access and harvest too frequently. On large ranches where peyote is adequately protected by the landowners or is remote enough from road access, it tends to be less hard pressed." I love C.C.I. they are such an amazing organaztion! THANK GOD somebody is doing this work! And if you make a donation they cast a broze peyote button for you to keep! Awesome! You said- "Peyote is not designated as endangered and not in need of being saved per se"
I totally disagree... many populations of Peyote have been completely removed either due to harvesting for their mescaline content or for the cactus market... tho it still thrives in some areas... Lophophora is near extinction in others! Especially the Lophophora in the U.S.A!!! It's correct that many peyote populations have been completely eradicated by over-harvesting or by agricultural activities like root-plowing, i.e. you could say that peyote is endangered at the local population level. But given the extensive geographic range of peyote and the number of peyote populations that are not under pressure by various human activity, I don't think you can say that the species as such is endangered - that being said I think it is important to look into why peyote is under serious pressure in certain areas, especially in the US, and what can be done about it (and that's why the work of CCI is so important). If you check the IUCN Red List and search for Lophophora you won't find Lophophora williamsii listed. Lophophora diffusa on the other hand is listed as "Vulnerable", i.e. according to the IUCN not even L. diffusa is designated "Endangered". Compared to L. williamsii the range of L. diffusa is very limited (about 400 km²), with a population estimated at less than 5,000 individuals (and the population trend is decreasing). I know this is a very complex issue and am not saying that nothing should be done (on the contrary I'm saying: Go support the CCI ;-). No matter if you believe that peyote is endangered as a species or not, the sustainability issues in relation to the "peyote gardens" of Texas being over-harvested by peyoteroes are very real. The only institution I'm aware of doing serious, scientific work on these issues are the Cactus Conservation Institute, again illustrating the need for supporting their efforts. As a side note regarding the Lophophora species, what do you think about this Lophophora identification key and guide: http://www.kadasgarden.com/Lophophorachart.html? It mentions L. Koehresii as a species, but isn't is a variety of L. diffusa? On the other hand, my currently flowering Lophophora does seem to be a L. diffusa var. koehresii, according to the characteristics outlined in the key. But what's your opinion - is the key any good? Dyro, I think Kada's suggestion for a key for Lophophora (a genus that almost seems to elude any attempts at a formal classification ;-) is quite good, but not complete. For example, you cannot use the trait of having 21 ribs as a uniquely identifying characteristic of L. diffusa, as L. fricii plants also might grow this number of ribs. Also, I'm not fully convinced about the classification of L. alberto-vojtechii - I would say that some of my L. williamsii plants have white flowers (or are they actually an extremely pale pink?) with a pink midstripe, but that would classify them as L. alberto-vojtechii according to this key (as the plants also meet all the other characteristics). Not all forms of L. williamsii are self-fertile, etc. That being said I find Kada's work impressive and useful. Personally I also consider L. koehresii a good species and not just a variety of L. diffusa (even though some of my labels might say otherwise ;-) Martin Terry (president of the CCI) is conducting a DNA-based genetic study of the genus Lophophora, hopefully his work will bring more clarity to these questions (and result in a key for the genus). 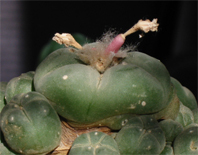 You might also find the CCI Lophophora quiz interesting. C.C.I. is such a wonderful organization! I encourage everyone to make a donation!! !